In June 2009, the new H1N1 flu strain was spreading like wildfire in western Canada, just as it was in dozens of countries around the world. But within a few weeks, the flames were nearly out, and a new study pinpoints a possible reason: summer vacation. On June 12, high schools in the province of Alberta let out for the summer. On June 19, the middle schools finished, followed by the elementary schools on June 26. Researchers from McMaster University compared those dates to the incidence of new H1N1 cases in Alberta, and using a complex statistical analysis, estimated that closing schools reduced flu transmission among school children by more than 50%. That, in turn, reduced transmission in the population at large. 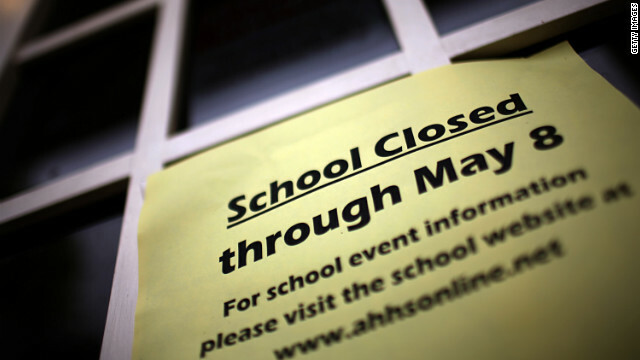 The findings, published in the Annals of Internal Medicine, support the idea that closing schools could reduce or slow down a dangerous outbreak of influenza. Many public health experts believe that closing schools could reduce the spread of the flu, but hard evidence has been scarce, said study author Dr. David Earn. The finding is important but not surprising, says Dennis Chao, a researcher in the Vaccine and Infectious Disease Division at the Fred Hutchinson Cancer Research Center. “If you know anyone with little kids, they get sick all the time, and kids get the flu more than adults. If you interrupt transmission in the highest transmission group, that’s a good way to stop the flu,” says Chao, who has also studied the effects of school closure. Indeed, the Canadian study is not the first to measure those effects. Medical historian Howard Markel found that closing schools – along with other measures, like banning public gatherings – slowed flu transmission during the deadly pandemic of 1918. A handful of studies have found that seasonal flu transmission slows during the winter school break, and another study, published last year, found that H1N1 cases in England dropped after the start of the 2009 summer break. What makes the Canadian study powerful is the detailed quality of the data on which it’s built. While the United States and most other countries stopped doing laboratory confirmations of suspected H1N1 cases as soon as it became clear the strain was no widespread killer, Alberta continued lab testing through October 2009, providing a definitive measure of changes over time. Also, unlike schools in the U.S., schools in Alberta follow a uniform schedule: all students in a given age group finish school on the same date. That makes it easier to see the effect of school attendance, or non-attendance, on transmission rates. The most recent guidance from the Centers for Disease Control and Prevention, developed in 2007, says school closure is not recommended when the illness is similar to seasonal flu, but says local officials should consider it an option when the flu strain is causing more serious disease. The CDC is working to update its basic planning document, but adjustments are a delicate and politically sensitive task. Even if the benefits are potentially huge, closing schools for an extended period may come with significant burdens – for example, parents missing work, increased childcare needs and disruptions to education. Other challenges include finding ways to feed children who depend on school lunches. Close any public place, stay home and there is your cure. Brilliant study...a 5 year old(with the flu no less) could have come to that conclusion. Yeah... but people will starve or eat their dog to survive. After a hurricane, people are out of food after 24 hours. That means they do not store non-perishable food items in their homes. If you tell everyone to stay home now, you create mass hysteria. I know, it is stupid to have no food in a house to even survive a few days but many are like that. Tell that to your boss....stay home? If you have a sales pitch in Timbuktu or stock shelves at Walmart, you are not gonna get paid and may get fired..Think Think. There are no easy solutions. Except possibly for you! There is no such thing as "a dangerous outbreak of influenza". It's the flu, you get over it, and your immune system is stronger. The world has changed drastically since 1918, that kind of pandemic simply cannot happen today. lol, couldn't, eh? You overlook the fact that the flu virus mutates rapidly, evolving to be more resistant. That's they they have to keep making flu vaccines – what worked last year will not necessarily work this year. You know how vaccines work? They put the virus into your body. It's supposed to be weak so your body can fight it properly and make the antibodies, but sometimes the weak virus in the vaccine wins, and you get the flu anyway. Some viruses can be more deadly than others, obviously. A pandemic HERE is unlikely. A pandemic in a variety of different countries could spell doom for them, as well as the ones that have to deal with them. A large scale outbreak of something a bit stronger in America also wouldn't be so easy. Again, vaccines don't always work the way they are intended to. Also, not everyone gets vaccinated. Little babies in particular are in danger if they are not old enough to be vaccinated. Unlikely, yes, but saying that it is impossible is naivete bordering on irresponsibility. The world has indeed changed a lot since 1918. Which means if influenza mutates to a nasty form again it will spread faster accross the world. We have just been lucky so far. Watch the movie Contagion and then decide if a pandemic could not happen. Since 1918, air travel has become so pervasive that any virus can spread so quickly that it could not be controlled. No country, no human would be immune. Plus, our governments are so lethargic and slow to act that a pathogen could spread far and wide before steps are taken to slow human contact and movement. There are killer bugs out there now (ebola, etc. ), and new ones will be created in the future. It's only a matter of time before the next one runs through humanity and thins out the herd. You get over it most of the time but many people die from the flu every year. Don't think you can't die... My brother in-law died from H1n1 in 2009 and he was healthy. No health issues or underlying conditions. Big and strong he was. So don't think you can't die. You can never be too cautious. this is an avian variant, kills 60%. look how fast the last pandemic spread and that was long before air travel. also i don't think they would have figured out how to weaponize it for grins, do you? Many world scholar doctors believe that in the next 40 years, a major pandemic will kill off between 100million to over a billion people due to lack of sanitation and over population. Just think how quickly a deadly diease could spread! lol u think it won't happen again? Just wait. the United States does not have the resources to provide that many body bags and to create such quanities of vaccinations in such a short period of time. How about you watch Contagion. Sorry Howie but u FAIL! There have been many other pandemics since 1918. Have u ever heard of the Asian flu and the Hong Kong flu (which have happened much after 1918). I don't need to watch contagion to know about its devastation. I just open up a history book. You also seem to forget that at least 200,000 people are hospitalized from seasonal flu-related complications. And because they go into the hospitals, which carry the bigger bugs like MRSA/VRSA/C-DIFF, they can go home with bigger complications or not go home at all because they die. Up to 50,000 people die, mainly the elderly and infants/children. So. It doesn't kill anyone? And also, since people do go into the hospital to get "antiviral" medications when it gets really bad, guess what they are doing to the flu virus? Making it stronger. How do you think VRSA/MRSA came about? By becoming resistant to Vancomycin and Methicillin, that's how! You. Are. Wrong. Different strains of viruses have different rates of infection and mortality based on a number of different protein components. Just because we've been lucky that high mortality viruses have not yet been highly infectious doesn't mean it's impossible. On the contrary, the odds that it WON'T happen in the next 50 years diminish with every additional flu-breeding human born into the world. duh quarantine works. any parent of school age kids could tell you this. sniffles (at least) all school year spread to the whole family, and fine in the summer. As a parent I miss plenty of work each year because my kids get sick. They only catch colds, flu, and virus's during the school year and never in the summer. My high school aged kids are the worst. They are changing classrooms all day, huggy-huggy with their friends, and are more comfortable with sharing their drinks and food. I would much rather have my school administrators close school for a few days to sanitize and clear the germs out than have to take many unexpected days off when my kids fall ill. When spring break comes around, no one is sick after the break. The U.S. needs to pay attention to this study. This is the research reported from Canada? Canada also found that the age at which mammograms are provided should be higher. No mention of that. these "scientists" have it wrong. It's not the indoors which causes the outbreaks, it the cold climates. Cold and flu viruses are designed to survive longer on surfaces when the temperature and humidity are low (I.E. winter). Adults work at companies year-round (indoors), and you do not see outbreaks in the late spring, summer and early fall. Key is to use good hand hygiene, not to touch the eyes, nose and mouth unless you've really washed your hands well. Yes, there will be times when aerosolized virus gets inhaled from sneezes and coughs...but the large percentage of route of administration of these viruses are through direct surface contact into the body. Hi Andy, I think you have it all wrong. Germs travel slower in cold climates. That is why hospitals are so darn cold. I live in California and it does not get that cold here. It just happens to be the time of year that illnesses are at their peek. It is possible to catch the flu or cold during the summer but transmission rate is much slower when kids are not cooped up in classrooms all day with 20-30 other students, or riding school busses to various school functions. Yes people in office settings can contract each others illnesses but not as severly since we are a little more spread out because of cubicles and office spaces. Also, most adults have better hand washing habits than kids. Why would the schools be concerned about feeding feeds that get free lunches when the alternative would be death or an expensive medical bill? The strains of flu that would cause high mortality hit the poor disportionally, they should be the first to be shielded from the effects of a pandemic. They also have the least available medical care in the event of infection. As for non-poor, when they get sick, your tax-payer dollars are used to treat them, the support for closing schools should be unanimous. How about good oral hygiene to reduce bacteria load in the mouth, covering your mouth with your elbow and turn away from people and touchable objects when you cough and sneeze, avoiding too much conversation with people in public, use hand sanitizers, sanitize shopping cart handles, use clean paper towels to open doors to public restrooms, don't shake hands, wash fresh produce. Basically, keep your hands clean, clean, clean. Very simple measures. Even a two year old is capable of keep their hands clean. how about the flu shots? It won't help with all strains but it will cover some. And I agree with Stacey, good hygiene goes a long way! The first two years I taught school I caught the flu. Then I started getting the flu shots. No more flu and I retired with nearly 200 unused sick days (10 are given per year). Parerea mea? Ca absolutizezi si nu e cazul. Sunt onemai cu care te dai cu capul de toti peretii sa faci echipa daca ei nu vor si nu vor, nu o vei putea face. Si punct. and dafydd,There are a bunch of nseaors why the web site built out from Steph's prototype would be a lot more expensive; it is a much much bigger project than a one page directory of links placed on a decorative background image of the map of the UK, that was probably made by one person in a couple of hours (however you figure that cost, it can't be very much).Steph's prototype calls for the creation of content about the flu that's probably not on any of the health web sites the directory has linked to, at least in the focused and topical way that Steph has indicated. Therefore, Steph has used the principles of user-experience design / information architecture to ask, what sorts of information would people be looking for depending on how they are being affected by the flu, and then created a layout to help people get to the kind of information they need as directly, as quickly and easily as possible. She has also added a number of applications to help inform the web site's users at other times and in other ways, and to keep them in touch with changes and updates, especially useful as all the information around the flu is subject to immediate changes. A web site and its applications are, of course, ideally suited to deal with all that.Steph's homepage is, then, a prototype for a reasonably large multi-sectioned web site; its creation and maintenance entails a lot of work, time, talent, and expertise both initially from a team of web developers and the content creators and then from the knowledgeable staff who will have to update the information on the site as well as posting very frequently at least on twitter and facebook if they are to have any value as well as responding to emails. The RSS feed is generated automatically but the news itself must be collated by someone and that will have to happen frequently as well if the site is to remain a news source.As some one who builds web sites, I work as a UX/information architect and front-end developer, I can assure you that Steph's prototype is certainly great work and that its building out to a real site is a lot of work and expense especially compared to a single page with a handful of links, probably made in a couple of hours, and that requires no maintenance or staff. Flu shots are worthless. Vaccines are worthless..
Fine. Close the schools for as long as it takes if that solves the problem. But the school year will, of course, be extended to satisfy laws regarding required number of class days. Closing school: NO. Older kids will head to the mall and hang out with friends. They bring the virus home. Little kids go shopping with Mom and pick up the virus at the grocery store and bring it home. Stay home if you can, wash your hands, gargle with warm salt water, clean surfaces everyone handles (doornobs, phone, tv remote). visit www. jujuinator. webs. com (no spaces) for more information about closing schools. I will look for this book. One book EVERYONE should read is Biohazard by Ken Alibek, The ihlilcng true story of the largest covert biological weapons program on the world- told from inside by the man who ran it. This shows that countries like the USSR are capable of ANYTHING and EVERYTHING. From the thoughts of most people that find biological weapons as terrible as mankind can get, there are individuals in these secret countries like North Korea, China, Iran, Syria, etc. that think up the most horrible means of killing as many people as possible. These countries are ALL capable of selling or just plain giving terrorists these weapons to hurt the West as much as they can. This book talks about how the Soviet Union in war with the U.S. was not only going to use nuclear weapons, but also the worst possible biological weapons to finish off anyone left after being throughly nuked. People MUST realize that they are NOT safe, and there are absolutely horrific weapons floating around out there ready to be used. The old saying is that with a biological weapon they get more bang for their buck (dollar). Everyone should go out and get this book that is interested in survival and preparing for the worst, because biological weapons are the worst of weapons of mass destruction and the easiest to attack with.